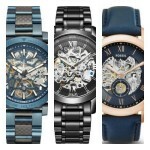 Hello, today I decided we would take a look at a few of the most popular Stuhrling skeleton watches for men. 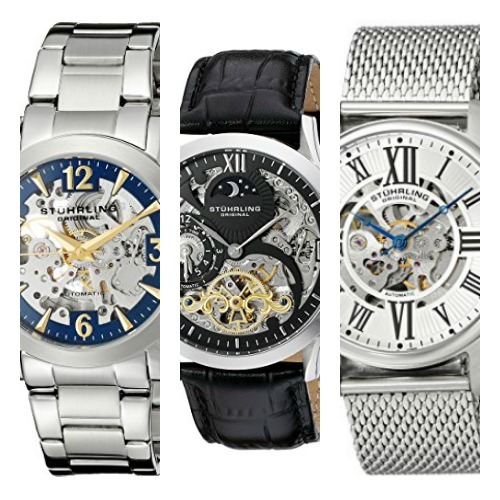 Stuhrling have a huge collection of impressive looking designs available when it comes to automatic skeleton watches. This is just a small example of what can be seen from them, I definitely recommend taking a look at what else is available though if these take your interest. Perhaps my good skeleton watches list could be of help. Hopefully this will give you a little bit of inspiration as to what you want from your next watch. If you have any questions about any of the watches featured in today’s list just comment below and I’ll try to answer them as soon as I can. For now, enojoy today’s list. The first watch to be featured on our list of the best of the best stuhrling skeleton watches for men is this timepiece from the Original collection. 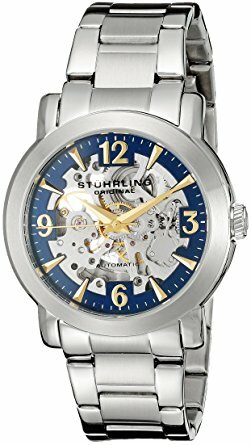 This men’s stuhrling automatic watch is built with a stainless steel casing that has a 42mm diameter and a thickness of 14mm. The strap that’s been paired with it is made of a soft genuine leather and fastens with a buckle style clasp. I love the dial design of this Stuhrling skeleton watch. It features large silver coloured Roman numeral style hour markers around the outer rim of the dial with the skeleton part at the centre of the dial showcasing the automatic movement at work. They’ve gone for slim silver coloured hands that I like the look of but think could occasionally be a little hard to read. Powering this watch is of course a automatic movement that never requires a battery as it’s powered by the movement of your wrist. You can view this movement through the skeleton dial or the exhibition style caseback on the rear of the watch. This is one of my favourite features so I’m really happy to see it included on this men’s Stuhrling skeleton watch. You can read my full 747.02 Stuhrling skeleton watch review here soon. Next up on our list of the most popular Stuhrling skeleton watches for men is this stunning Winchester Tempest II automatic watch. This model has a large 44mm stainless steel casing that has a thickness of 14mm. 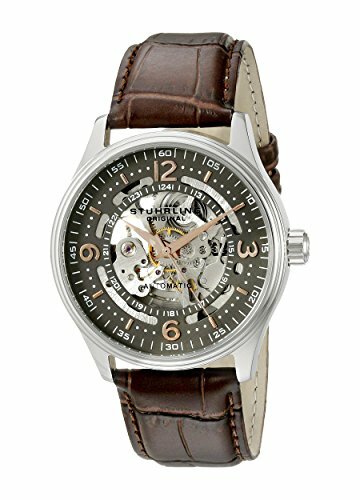 This watch is fitted with a comfortable genuine leather strap that fastens with a buckle style clasp. The dial design of this Stuhrling skeleton watch is just stunning, so much detail going on. You can view the movement working away through the skeleton dial. There is also a dual time display at the 9 o’clock position and a AM/PM indicator at the 12 o’clock position. At the heart of the watch is a reliable automatic movement that will never require a battery as it’s powered by the movement of your wrist. This self-winding movement can be viewed through either the skeleton style dial or the exhibition glass caseback on the rear of the watch. This men’s stuhrling watch also has a Krysterna crystal glass and a 50m water resistance rating. You can read my full Stuhrling Winchester Skeleton Watch review here soon. 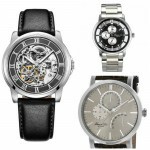 Here we have another popular men’s Stuhrling skeleton watch from the Original Atrium collection. 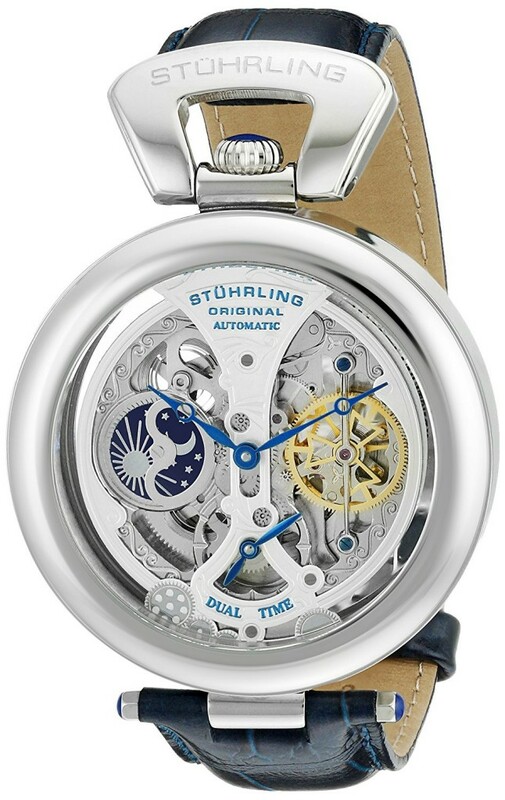 This Stuhrling automatic watch has a stainless steel casing that has a diameter of 42mm and a thickness of 13mm. The strap is made of a mesh style stainless steel and fastens with a jewellery style clasp. I find these to be very comfortable and easy to adjust. The dial features a mixture of large and medium sized Roman numeral style hour markers around the outer edged. The inner part of the dial showcases the movement through the skeleton style design. I like the use of the dark blue tinted hands, they look great and are also effective at standing out from the rest of the dial. 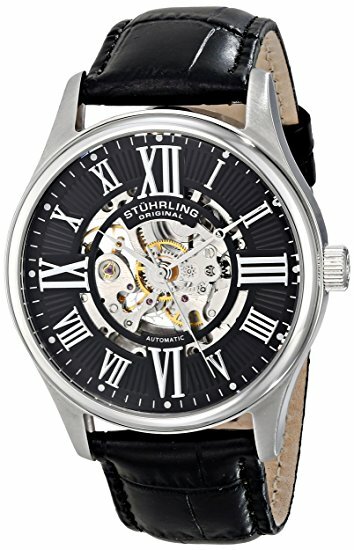 This men’s Stuhrling skeleton watch is powered by a automatic self-winding movement. This means it will never require a battery and is powered by the movement of your wrist. You can view this movement through the front or rear of the watch through the exhibition style case back. The dial is protected by a scratch resistant Krysterna crystal glass, this also covers the rear of the watch. As far as water resistance rating goes it has a 50m classification. You can read my full 747M.01 Stuhrling skeleton watch review here soon. This is a smarter looking Stuhrling skeleton watch from the Original Canterbury collection. It’s built with a polished stainless steel casing with a 41mm diameter and a thickness of 14mm. The bezel of this watch has a brushed finish to make it stand out from the rest of the casing. The strap is also made of stainless steel with a mixed brushed and polished finish. It fastens with a push release deployment style fold over clasp. The dial features a mixture of numeral and triangular style hour markers that are tinted with a gold colour the match the hands. This makes them stand out brilliant against the deep blue outer dial and the silver colour of the automatic mechanism that can be seen through the skeleton design. 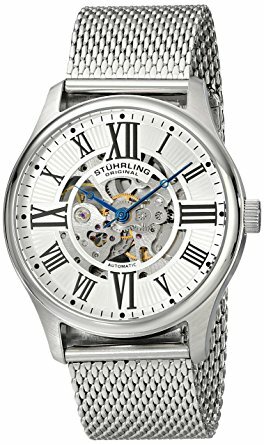 This men’s Stuhrling skeleton watch is powered by an automatic movement that’s self-winding and never requires a battery. You can view the movement working away through the front skeleton style dial or the rear exhibition caseback. From the rear of the watch you can see these beautiful blue tinted scews which I think looks pretty nice. Extra features of this watch include a 50m water resistance rating which is likely to come in handy for some. The dial and caseback are also protected from scratches and knocks by a Krysterna crystal glass. You can read my full 531G.33116 Stuhrling skeleton watch review here soon. Here we have a Stuhrling Original skeleton automatic watch that’s built with a 42mm stainless steel casing and has a thickness of 13mm. This model is paired up with a nice brown coloured soft genuine leather strap and fastens with a buckle style clasp. The dial shows off a nice amount of this Stuhrling automatic watch movement. There are rose tinted numerals with an outer minute track on the outer part of the dial. I think the rose tinted hands are also pretty easy to read on this model as they’re easy to tell apart from the silver colour of the automatic movement. Powering this Stuhrling skeleton watch is an automatic self-winding movement that charges itself up from the movement of your wrist. This movement can be seen through the front skeleton style dial as well as the exhibition style caseback. Features of this watch also include a protective Krysterna crystal glass for a good level of scratch resistance, this can be found on the front and rear of the timepiece. This model also has a 50m water resistance rating which is good to see. You can read my full 730.02 Stuhrling skeleton watch review here soon. 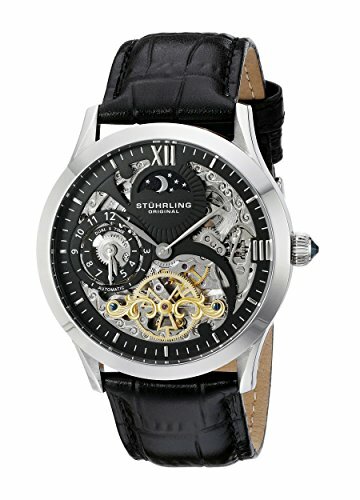 Last up on our list of the most popular Stuhrling skeleton watches for men is this rather impressive looking timepiece. It features a large rounded stainless steel casing that has a diameter of 48mm and a thickness of 14mm making this an oversized Stuhrling watch. A stunning blue coloured alligator embossed genuine leather strap has been paired up with this watch. It fastens with a butterfly style clasp which happens to be one of my favourite styles. The dial features this beautiful looking design with an animated AM/PM display at the 9 o’clock position and a dual time display at the 6 o’clock position. I like the use of the blue tinted hands that add a brilliant addition of colour to the watch. This men’s Stuhrling skeleto watch is powered by a self-winding automatic movement that never requires a battery and is charged from the movement of your wrist. You can see this movement through the skeleton dial design as well as the exhibition style case back. A protective Krysterna crystal glass can be found on the front and rear of the watch to offer a good level of resistance to scratches and knocks. This timepiece also has a 50m water resistance rating. You can read my full 127A.3315C2 Stuhrling skeleton watch review here soon. 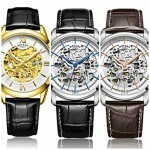 Thanks for taking the time to read through today’s list of the best Stuhrling automatic skeleton watches available for men. What was your favourite model? Comment below and let me know.